A handful of Runnababez took the streets of the Windy City, Chicago this past weekend competing in the USA 8k Championships. We competed for the first time ever as a team at the USA level, it was quite the experience for everyone! We were going to be racing against the top teams in the midwest, east coast regions, for example one being Hansons-Brooks. I (Lisa) didn’t want to frazzle too many new “runnababies,” feathers so didn’t make it a big deal. Because in all reality it isn’t, it’s just another race to lay it on the line, and compete with your fellow team mates. “What’s a USA Championships?” , Tim simply says, “It’s a USA Championship in which you compete against some of the best teams in the region. Tim: “You will all be fine.” Baby Badger was just sitting chilling. After checked into our room, we did a quick shake out run. Amanda mentions to us we need to see this ginormous mirrored bean! It intrigued us all, I said can we run to it now? Can we find this big bean? We need to see it! We kept thinking we were getting closer, and asked one of the race course guards.. He said he didn’t know where it was. However, we stumbled upon it! We started screaming and sprinting towards it for some reason…lol. 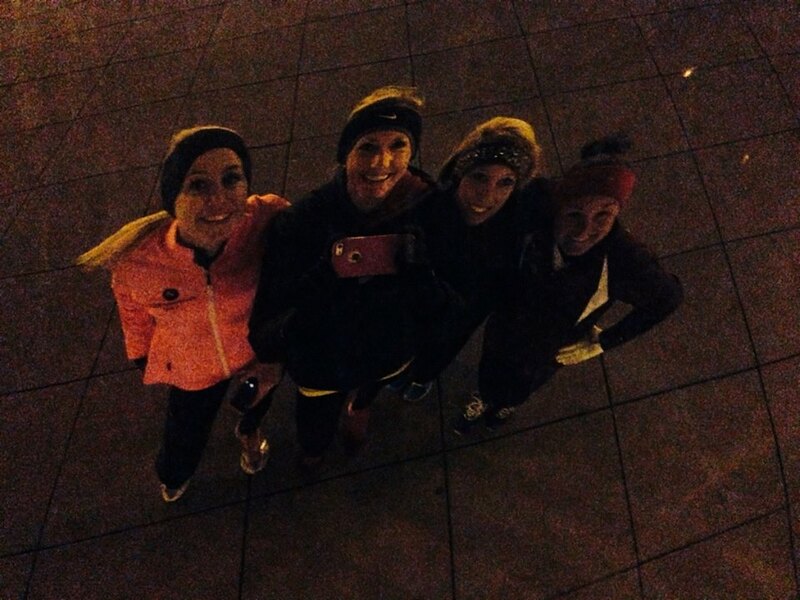 Here is our bean selfie..When you take a pic in it, you can get reflected…Weird & cool! After the bean it was time for us to eat. We decided to go get pizza for dinner ,because it was cold and we were walking, and that there was a pizza place every 5 feet. We all agreed pizza it is! Once in there though we find out Turbo doesn’t eat pizza…GEezuz Turbo ! HA! She was missing out! Some of the best pizza ever ! 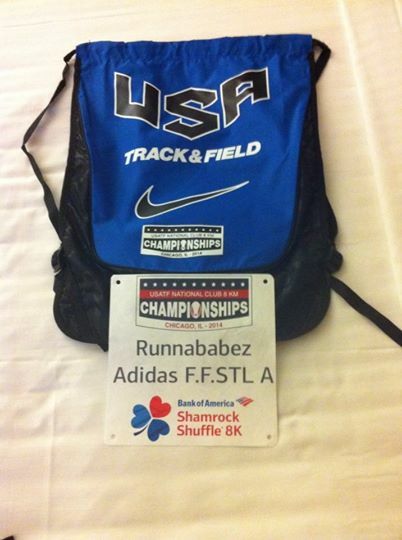 We got back to the hotel, arranged our race bibs and really loved seeing, “Runnababez,” team name printed out on our bibs super cool! It made me feel kind of really happy inside, to be here at this level of competition, not just me, but with team-mates. Jackie & I were always jealous of seeing other girls with team mates at other US Champs, Olympic Trials, and other big races. We took it upon ourself, to start Runnababez.. We wanted to train hard, we wanted to have fun training, we wanted other team mates to train with, and we wanted it in St. Louis. Seeing this bib made me realize that this was now a reality. Probably one of the coolest feelings ever for me, since I know how much Jackie, & I have wanted something like this and had worked so hard to develop this into the team it now is. Race day morning…This Shamrock Shuffle was HUGE! And by huge I mean, HUGE!!! Walking out of the hotel, to see 40 thousand people ready to run! Heck I thought it was only a few thousand. Nope, they had waves of this race, and fields of porto-pottieS! The Runnababez , Coach & I all wandered over to the elite start corral. Which was tricky, and it always makes me nervous, because I have been trapped out of corrals before, because workers don’t look for elites really. I have had to jump fences before to get where I need to be, and wanted to get the ,”Runnababies,” all situated in our corral since most were nervous and new to this level of race situation. We got in fine, and gates were opened for us left and right clearing our way. Some babies were like , “Wow this is sweet !We are really treated like royalty . lol. !” They even had a nice heated huge tent for all elites to get their racing gear situated and our private warm up field! It was very nice! 5 or so minutes before race we are called out of our elite tent, and are allowed to do strides in this fenced off 20 yard area, that I tell the babies, go ahead let’s do strides. It’s a little, “stride zone.” Some other girl from another team heard me say, “It’s the stride zone,” and then started calling it stride zone as well. haha! Then it is full of girls running back and forth like hampsters cooped up. All out to the starting line, we situate ourselves. I keep telling Turbo we need to sit right on those girls in Red & Yellow..The Hanson team. Amanda & Lauren line up together and the gun goes! Off we went! I took off a tad zesty…Turbo a tad zesty as well. But all and all ran tough, and relatively smart. 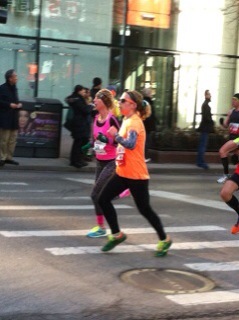 We were off through downtown Chicago! Best course ever, it was like 1 mile straights, and turn every mile. I felt pretty good , but was digging deep as I could, but could feel the quick first 800 coming up on me, that locked my legs into a groove all the way through. The last 800 which went up a ,”baby,” hill a overpass I felt my quads locking up like I was running a 400 meter dash! I kept digging, kept pushing and finished with over a minute and half PR for a 5mile (8k) to see the clock say 28:57. I turned back to look for team mates. I see Turbo blazing it in! 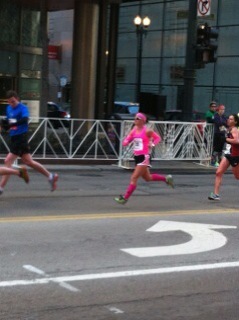 She too ran an awesome race ,and finished in at 29:17. We looked for more PINK! We soon see Amanda running in at close to PR time ,of 32:08! 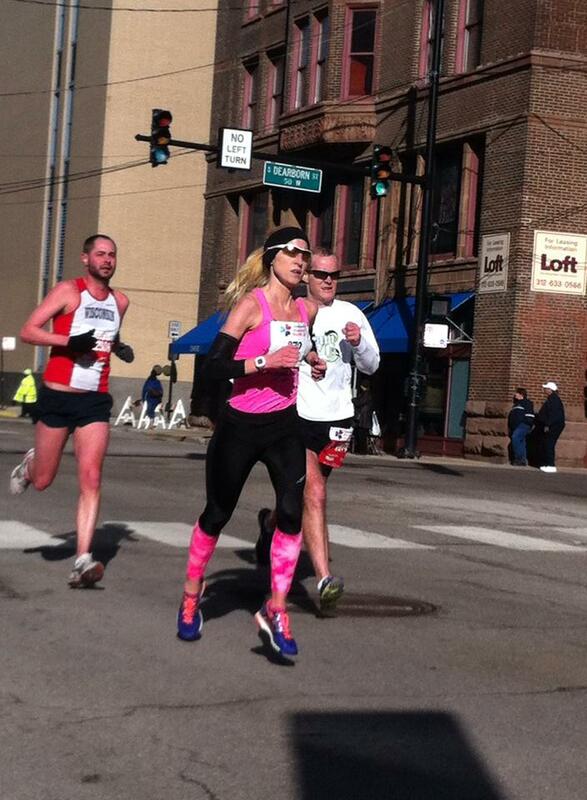 A heck of race for Amanda since she felt dead just a week before from heavy half marathon training! 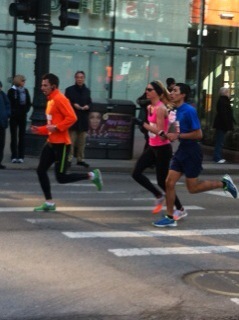 Another great run!, and then we see Lauren running in at well under her fastest time ever for a 5 mile! She ran 33:29! Previous best of 35 mins! So we had all Runnababez in and faster then we had thought too! 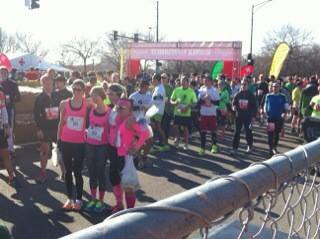 WE couldn’t wait to see how we stacked up against this fast field of ladies! We ended up finishing 11 th as a team, out of around 25 teams! Hanson-Brooks won, but they really weren’t all that far out of our reach…Next year! Also only 30 secs out of moving into the top 7 or so teams! We weren’t that far off from some of the best teams in the nation! We were pumped! We all showered up back at the hotel, and then went and got ourselves some DEEP dish Pizza ! MAN it was good! Haha we couldn’t get enough pizza! Then after that I brought the Runnababez and I some pink champagne to celebrate by popping the tops off into the Lake…Yes. kinda bad. But, ya fun! ← 3rd time is a charm for Amy Marxkors!